Astra, like fellow countrymen Clairvoyants, is another Italian band that began as a tribute band. Their forte is Dream Theater. 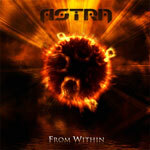 However, don't expect Astra to sound like that venerable progressive metal band. They have definitely developed their own style of progressive metal. From Within, their second full length release and first with Lion Music, begins with a strong foundation of power metal. Upon this is built captivating melodic metal with layers of strong vocal arrangements, riveting guitar work, rich keyboard arrangements, and above all, breathless energy and enthusiasm. Kudos to Lion Music for snagging Astra for their roster. 'From Within' is a creative and completely captivating work which will please those who delight in straight up melodic progressive metal. Highly recommended! Kudos to Lion Music for snagging Astra for their roster. 'From Within' is a creative and completely captivating work which will please those who delight in straight up melodic progressive metal.